Microsoft was looking to engage with senior IT and business decision makers in order to build up its position as a thought leader in the field. To accomplish this objective, the company collaborated with LinkedIn and tried leveraging the breath of LinkedIn’s marketing solutions portfolio to fabricate a consistent content marketing campaign. Microsoft is an American multinational corporation headquartered in Redmond, Washington. The company develops, manufactures, licenses, supports and sells computer software, consumer electronics and personal computers and services. To build up its position as a thought leader in the field by creating a targeted and comprehensive format and engaging senior IT and business decision makers better through content marketing. • An exclusive by invitation only community called ‘Be Future Ready’ was created, which acted as a dynamic hub for information sharing, engagement and dialogue between Microsoft and senior decision makers. • A Slideshare channel was launched and slideshare content ads were leveraged allowing their community and consumers to engage with content while still on LinkedIn. • The Microsoft company page was set up to advocate the wide Microsoft portfolio. 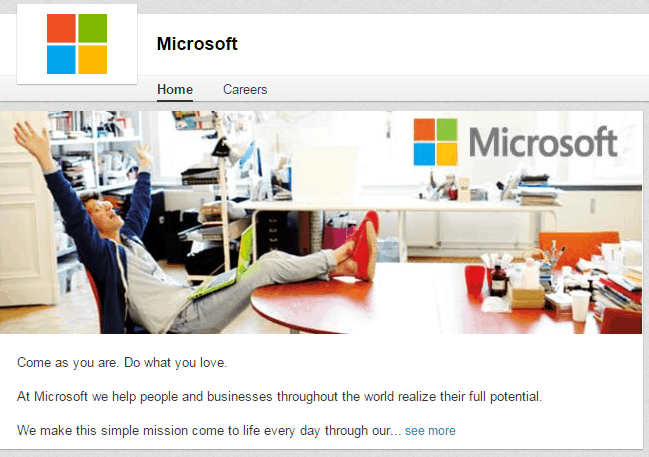 • Microsoft leads amongst its competitive set in terms of LinkedIn’s Content Marketing Score as well.